Lakeshore Resort and Campground - Windermere B.C. The Lakeshore Resort and Campground is the Columbia Valley’s largest campground located on the pristine shores of beautiful Lake Windermere. Lakeshore Resort and Campground is located less than a three hour drive from Calgary. Nestled in the beautiful Columbia Valley, the Lakeshore Resort and Campground offers spectacular camping and recreational opportunities. Bring the entire family and enjoy the last publicly accessible lakefront campground on Lake Windermere. Ideally located a few short kilometres north of Fairmont Hot Springs, B.C. and south of Windermere, B.C., the Lakeshore Resort and Campground is 100 per cent owned and operated by the Akisqnuk First Nation. In operation for more than 30 years, the Lakeshore Resort and Campground is a strong component of the Columbia Valley’s regional tourism economy. The Lakeshore Resort and Campground contributes to the tourism economy of the Columbia Valley and the Akisqnuk First Nation. Its mission is to support the well-being and economic self-reliance of Akisqnuk First Nation members through sustainable employment, and as such you will have the opportunity to meet the First Nation people and listen to their stories of the culture and land. 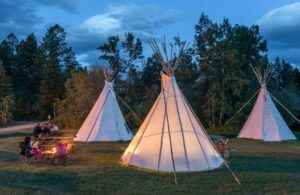 Several types of overnight camping and rental options exist at the Lakeshore Resort and Campground: tipi rentals; non-serviced and electrical sites; a chalet; and the Legacy Hall for functions like weddings or reunions. Nightly campers have access to all Lakeshore Resort and Campground amenities.